I like listen to online radio while I surf websites, we have two ways to listen online music: web based player or a desktop client. I use both, sometimes use web based player, sometimes is a client. If I want record something from radio I must use a client. Today I would like introduce a desktop client for listen and record internet radio program. 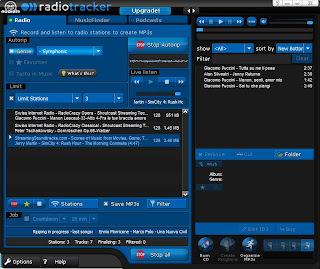 RadioTracker is a very good desktop client for listen and record music from internet radio program. Newest RadioTracker Platinum version costs $26.90 US dollars. But we can get an old version (RadioTracker 4) for free now. Just go to this promotion page, click "Register" button, it will take you to another registration page, fill your email, name, click "Proceed and receive your serial codes" button. You will see a password: AQ-RT4. I guess everybody get same code. Next, download RadioTracker 4. Before you install this software it requires a password, you can fill this one: AQ-RT4. I did try RadioTracker 4, it is very good for record music from some radio stations, but the software is too big - 44MB, compare to other radio recorders it seems a huge chunk.